Desford Lawn Tennis Club have seen their tennis courts being given a makeover. 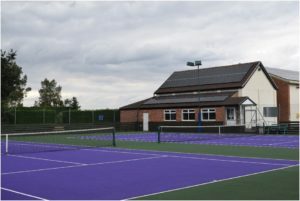 Two courts have been cleaned and resurfaced using a sand based acryclic binder and have been painted purple and green. The binder will give the tarmac an extended life of between 3 to 5 years. This makeover has been undertaken thanks to a grant from the Mick George Foundation who have awarded £5,000 to SiD towards the project. Fosse Contracts Ltd have undertakien the work to great acclaim. 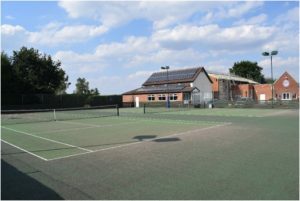 The courts were cleaned on 10 July and painted the week commencing 9th July and are now ready for play again. This very popular club runs 17 sessions a week and with the summer camps and growing membership the resurfaced court will see very heavy use.